Fresh-ground pepper is a simple way to add a bit of luxury to your tabletop, compared to standard salt and pepper shakers! 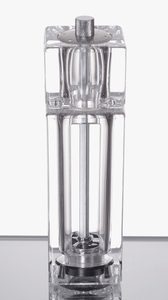 This 6 1/2" tall acrylic pepper mill is ideal for treating your guests to freshly ground pepper at your restaurant, bar, hotel, or catered events, and its convenient salt shaker top lets you also dispense salt from the same product. "We love this salt & pepper shaker combo! Easy to wash prior to use, easy to fill, easy to use, and looks great on the table! And the price is right too!" There's no need for two separate shakers with this mill! It puts two of the most commonly used toppings, salt and pepper, into one convenient place for your customers and it also looks great on the tabletop, adding a unique pop of color from the peppercorns and salt. The salt shaker on the top of this combo lets your customers easily dispense salt onto their favorite dishes. Opposite the salt shaker, a mill base grinds up peppercorns for a fresh, spicy topping on any dish! 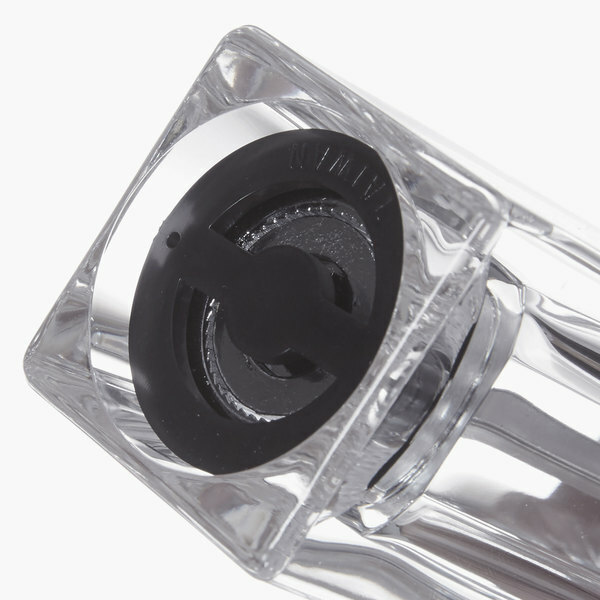 Moisture can quickly ruin the product inside any salt or pepper shaker. However, this combo unit features durable plastic gaskets to keep the interior dry at all times. The pluses: Shaker is nice looking, acrylic is sturdy and holds up well. I like the size. But, they are a little awkward to fill and the salt part doesn't hold nearly as much as the pepper. We fill salt probably every other day but pepper lasts forever. buenisimos resistentes de muy buena calidad y muestran la imagen de un buen restaurant durables y facil de labar y darle mantenimiento cada que se necesite . These are fairly durable. Obviously if they are abused they will wear out. We've used them for almost two years in a busy restaurant, and only 2 broke. I call that a win. We did have a few customers pocket them because they thought they were cool. I find that this was not a great purchase. The unit falls apart easily, and the salt gets clogged even when you use a fine grain. We appreciate your review, Saxon! We are sorry this salt and pepper mill did not meet your expectations. If you ever have any questions about the product you purchased, please contact our Customer Solutions team. These combo shakers are very handy and work perfectly. They are easy to hold and easily grind pepper for seasoning your plate. The pepper tends to grind on the fine side, but that is ideal for seasoning before you eat. Great value, and solid construction. We ordered these as a suggested alternative to the Chef Specialties combo grinder (we had the 3 1/2" Chef Specialties combo, but wanted the larger capacity of the 6 1/2" size). 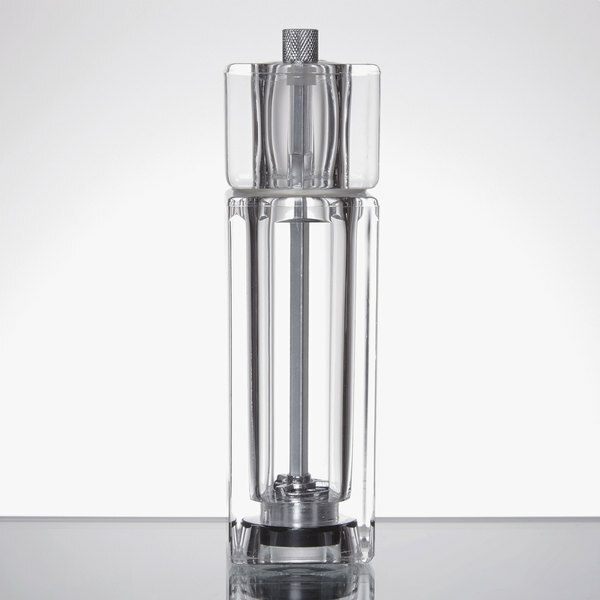 While this item looks very similar and has been durable enough, we very disappointed with the quality of the pepper mill. It grinds somewhere between very fine and not at all, and the grinders seem to be working less well with each passing week. The Chef Specialties version seems to be of much higher quality. I'm in the middle on this product. The holes on the salt shaker are on the small side and the salt container small. The pepper grinder is also very limited in size of grind. I have had trouble even getting pepper to come out at times. This seems to be getting better over time though. One good thing with the grind is that it does decrease the amount of pepper I go through. These are ok, but a little too large for our tables. They tend to get knocked over very easily since they are so tall. 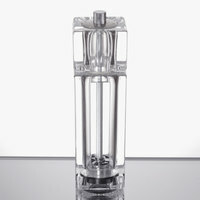 The quality of the acrylic is good and the mechanisms work fine. They are a little difficult to fill. I would not reorder them for our restaurant but only because of the size. I wish I had gotten the smaller version. I first saw a shaker like this one at the hard rock cafe when I was on vacation, I set out on a mission to find one, this site never lets me down! 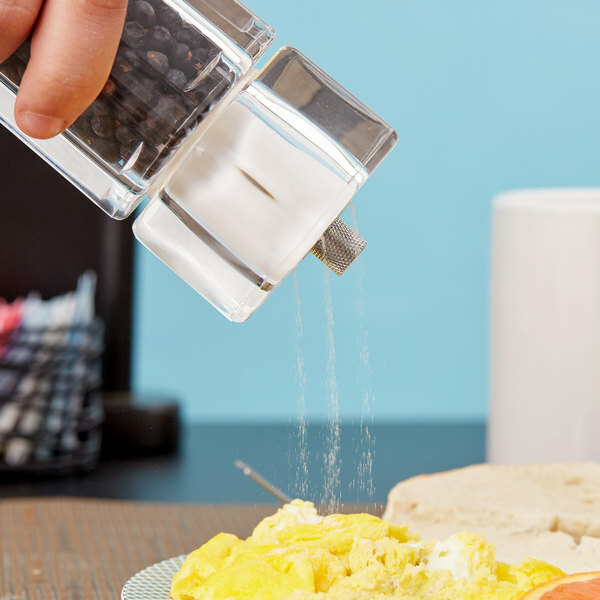 I love having both the salt and pepper together and also being able to grind the pepper at the table. all of my friends want one, the price was great also! Have used these before, work well, the mills hold up. Only complaint is if you do not unscrew the nut on top every few days, they seize up and snap off the screw holding them together. Again, no biggie if you care for them. Thank you for your review. We are sorry to hear that these salt and pepper combos had scratches on them when they arrived. A Customer Solutions Representative will contact you shortly to fix the issue. I have used these for a year. One WAS used for extra course salt and the other used with black peppercorns. The extra course salt ran out when using the mill. Now I use medium grain pink Himalayan salt. The medium grain salt works very well. The black peppercorns are a different story. Because they are round, the cutters do not have anything to attach themselves to. So, it does take a little longer. I broke the top of the mill because I forced it too much grinding the pink salt. I would purchase again. This is a great value. These pepper mills are very sturdy in the sense that when dropped they will not break, however they are very loose and do not grind the pepper very well. When attempting to grind pepper it takes many turns to even get a decent amount of pepper out. No wonder this mill is so popular! No need for two shakers at the table. 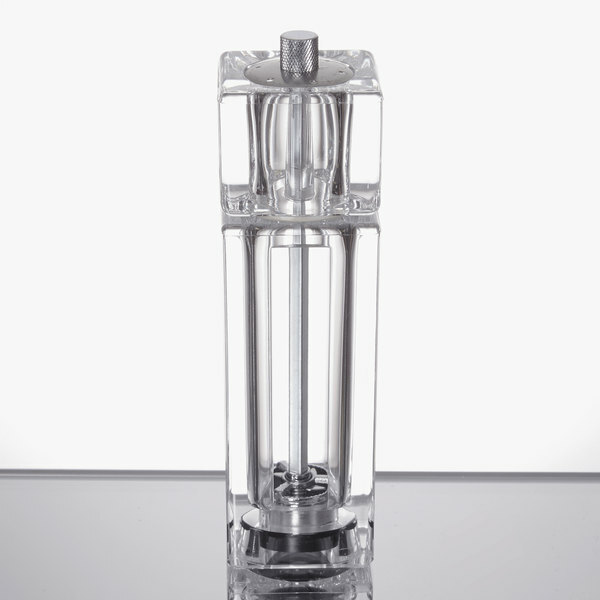 This Acrylic Mill also looks very sleek which is such a surprise for the low price. We love this salt & pepper shaker combo! Easy to wash prior to use, easy to fill, easy to use, and looks great on the table! And the price is right too! these salt and pepper grinders are beautiful. They are well made-very Heavyweight and they work great. instead of renting them for a big event I catered-I purchased these for practically the same price and gave them away to my guests-they love them!! 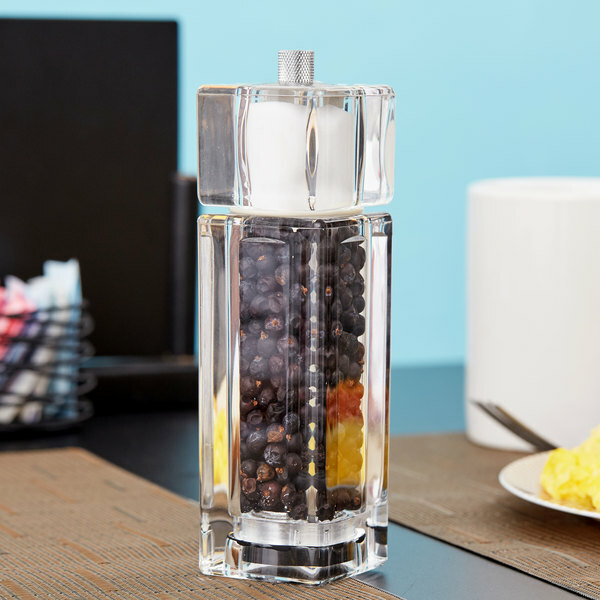 This salt and pepper mill works and looks great! I have a miniature version of the same mill, so this compliments it nicely. The grind is adjustable and gives consistent size flecks of pepper. Out of all the products I have purchased from Webstaurant Store, this is my favorite. The look is elegant, and the feel in hand is smooth and sleek. The salt compartment is at the top and grinder at the bottom. Easy to fill and a nice addition to my party tables. I purchased this Salt/ Pepper mill to use around my dining room table. It looks and works great. It is so nice to have fresh ground pepper, and salt too, with my family's meals. these are great salt and peper mill combo . you can leave on table, thay look nice. and very clear and you can see whats in them. This salt and pepper mill combo is great. You can shake out the top with salt and grin the bottom for pepper. It's definitely a space saver. 6 and a half inch acrylic salt or pepper mill is a great investment to make as it's durability strength is great and for the price to pay. There is no doubt that grinding your own pepper speaks freshness load and clear. The visual effect and timeless design of this set is outstanding. A handy dancy tool in providing the best and freshest taste of peppers to your customer. It's small and portable enough to leave on dinning tables. This pepper mill is ideal for our bar. It is not too big and heavy and seems as if it will last longer than the other cheaper plastic one we had. These would be great for a small casual diner or restaurant. Also a good deal if you are buying in bulk. This is a good buy for sure! 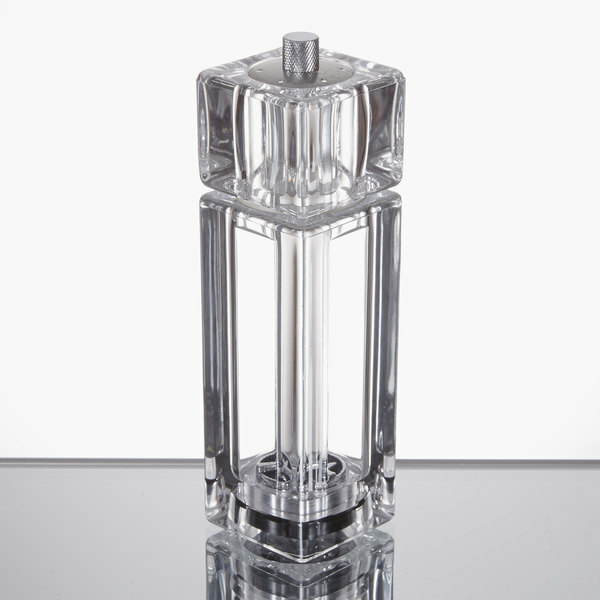 I am really impressed at the quality of this pepper mill, don't let the fact that it is acrylic turn you away, it looks like glass and has a nice heft to it. I bought the peppercorn blend also, and it looks really nice in this mill. This is a pretty nice pepper mill! Not only does it grind fresh pepper nicely but it has a built in salt shaker too! This eliminates the need for two items! Great convenience item!! I bought one of these around a year ago and it has been grate, pun intended. It is still grinding like a charm. We use this behind the counter when making foods because, in my opinion, the flavor of fresh ground pepper does not even compare to that of per-ground pepper. why do i like this one? thats because its clear and acrylic so you can see what your grating. the plastic is thick and durable. 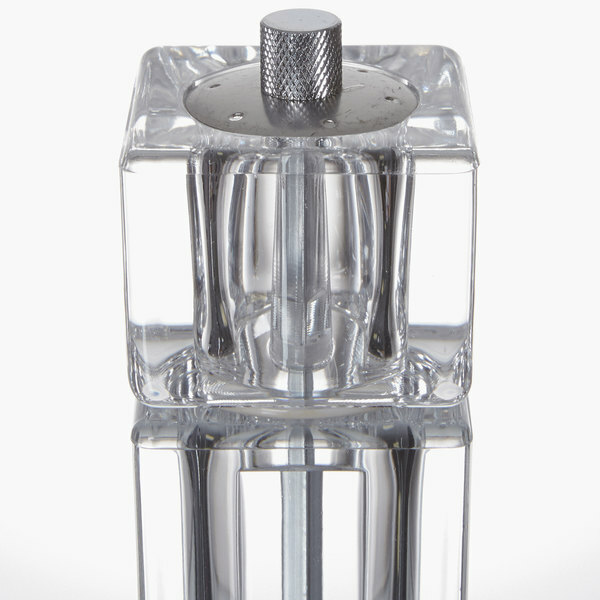 We think this will be a very useful tool...in addition to grinding fresh peppercorns, it has a special topper for salt. Two tools in one!